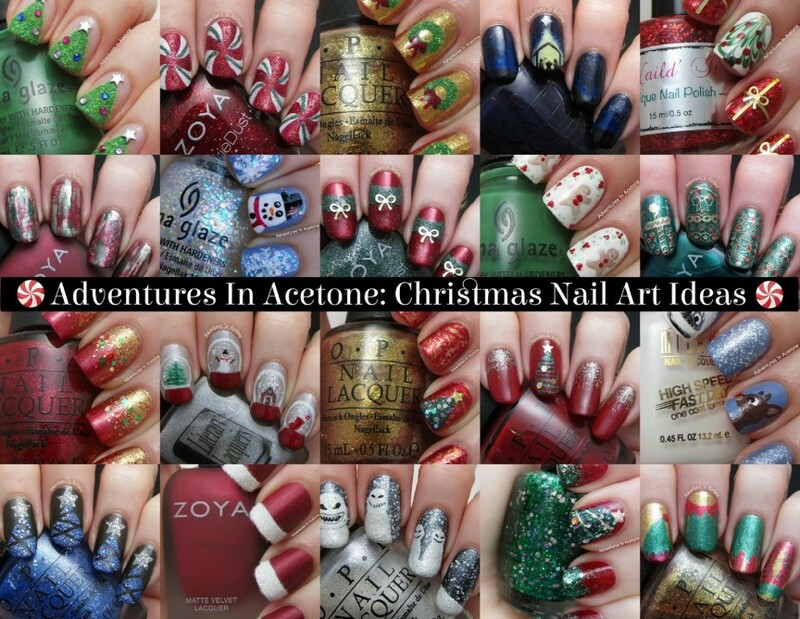 Christmas Nail Art Idea Round-up! Good afternoon, readers! Monday starts Winter Wonderland Week with The Digit-al Dozen and I’ve been going through some of my old ideas for Christmas/winter nails from the past few years. Today’s post is a round up of my previous nail art looks to hopefully give you some ideas for this holiday season! Click on each picture to go to the design’s original post and learn more about how to recreate it! The real reason for Christmas, these were my nails last year and I loved how they turned out. One of my favorite Christmas designs ever, even if not very practical. Striping tape and textured polishes make for a fun holiday design. A simple gold glitter cuticle gradient pairs well with this abstract Christmas tree accent nail. I watermarbled to create a tree shape and added striping tape and gold bows for the present nails! The base of this manicure is a saran wrap texture with red and gold. This was the first manicure I did with a Christmas tree, 3 years ago, and it’s simple enough to easily recreate with glitter ornaments. The flocking powder addition to just the green wreaths make this mani SO fun! This incorporates Christmas into the popular half moon mani, and the texture is a nice addition! Who doesn’t love snow globes? It was easy to make these into nail art. Another favorite I have done, and I couldn’t help but add texture! A matte velvet red base with white flocking powder tips really resemble Santa’s suit! Sometimes simple stamping can be really fun. Elves wear the cutest clothes! Okay, maybe not so “Christmasy,” but you could definitely do some happier snowmen with this same idea in mind! A more traditional snowman with iridescent glitter and snowflakes. A green base with red glitter looks great in contrast to the golden Christmas stamping! Using the distressed dry brush technique, all the Christmas colors come together for a unique look. Looking for something glamorous? This Christmas glitter gradient is easy and quick! I can’t wait to hear your favorites! Please comment below and let me know which you want to try out. Also, I’d love to hear if there are some you want a tutorial for. Thanks so much for reading! These are all beautiful manicures! I remember some of them and others are new to me. I loved the nativity scene you did last year too. I think that was my favorite and then the one with Rudolph and the Bumble.But all are wonderful. Thanks for doing the roundup and putting them all here together. I will mertíteni posztból the idea! I'll post the mentioned site.